Are you looking for the right tool to be able to make cuts on tiles? Well, you will need to find the best tile saw. However, if you have attempted to shop for the tile saw, you must have noticed that the market is flooded with so many models. As such, when you go to the stores you may end up being confused on the one to buy. Without proper guidance, you may have a hard time picking the saw that will serve your needs effectively. While they may all appear to be the same, you can be sure that the features and other aspects will differ. There are so many companies that have manufactured tile saws and more models are bound to come into the market, every now and then. There are some who offer high-end saws, while others focus on budget models. Whichever the case, you need to choose properly so that you can end up with a model that is efficient and will last for a long time. I have reviewed a number of models and the essence of this guide is to advise your buying decision. 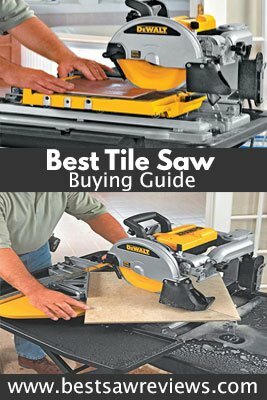 At the end of this guide, you will be in a much better place to shop for a tile saw. 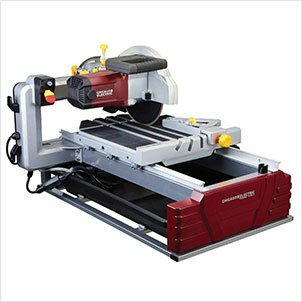 Why Tile Saw and Its Benefits? Tile saws are part of the tools that are designed for a specific purpose. With the tile saw, you will be able to grind tiles to the size and shape that you want. As such, you will have the desired outcome and this ensures that you have minimal wastage and a desirable result. With the best tile saw, there will be no breakage and cracking of the tiles. There are tile saws that use water and this will provide a cooling effect to the blade and as such, the tiles will not break or chip off. 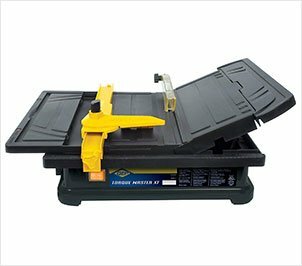 The tile saw can be used to cut a number of materials including porcelain, ceramic and stones, making it versatile. 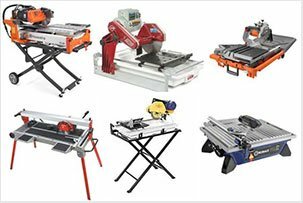 You will have the choice between handheld and table tile saws, such that you can choose the one that is convenient for your needs. This is a tool that is easy to use and the best tile saw with a sliding table will secure the tiles such that the cuts will be precise. The blades of tile saws do not have teeth as they are made of diamond, making it much safer than the blades that have teeth. If you are in industrial tiling tasks, then you will need a heavy duty saw and there is no better option than the DEWALT D24000S. This is wet tile saw weighs 69 pounds and you will not have any difficulties setting it up. It is a 10 inch saw, which gives you a wide cutting capacity and since there water attachments on the side and rear part of the saw, it has an excellent cooling effect. This makes it work on all heavy duty tasks, without the blade overheating. The precision of the saw is what makes it a preferred model among most experts in the tiles cuting sector. This saw has a stainless steel rail system and this is part of the frame. This is designed to enhance the accuracy of the cuts that are made. The water system is designed in that the water is only sprayed to the blade area and the workpiece. There is a stand that you will get with the tile saw and this will give you excellent support and allow you to hold longer workpieces. The stand folds over, with ease when you need to store and transport it. This model takes very little time to be able to set up and use. You can use it as a jobsite or workshop model. The saw is able to tilt to 22.5 degrees and 45 degrees and as such, you will be able to make diverse cuts, without much of a problem. There are 2 water nozzles on this DEWALT D24000S and they are fully adjustable making it possible to economize the use of the water, for wet cutting. 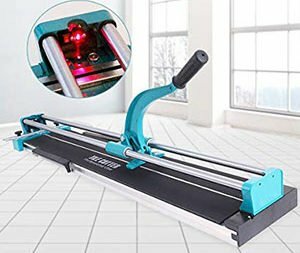 There are adjustable rollers that will align the table to the saw and this is one of the ways to ensure that you are making neat and accurate cuts. You can cut to a depth of 3 1/8 inches and you can use it to cut V-caps and pavers. 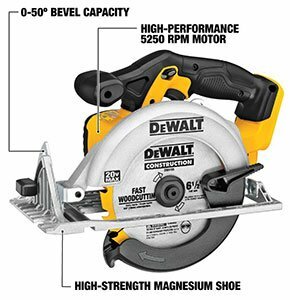 The DEWALT D24000S is a tile saw that weighs 69 pounds, which is a manageable weight and gives the saw the stability that is required. Since this is a wet tile saw, it comes with 2 adjustable nozzles that will allow you to set the water level depending on the task that you have. The cutting cart is a great feature on DEWALT D24000S as this will be used in making quite a number of different cuts. This saw allows you to make diagonal cuts of up to 18 x 18 inches on tiles and will also support rip cuts of up to 25 inches and 28 inches with a plunge. The DEWALT D24000S comes with a stable stand and it has adjustable rollers and other features that facilitate faster and accurate cuts. The Chicago Pneumatics manufacture great tile saw to have as it can be used to cut both tiles and bricks. This is considered to be a mid-tier tile saw and you will love the fact that this saw is quite aggressive and will make industrial cuts, without any difficulty. The 2.5 horsepower motor is a great advantage as this is what gives the saw enough torque and power to handle most of the task. This is a wet tile saw and as such, it comes with a functional water pump that will provide the cooling effect and ensure that your blade does not break or crack the tiles. It has a large steel frame that is a great advantage, especially when it comes to durability and sturdiness. The precision linear bar system will provide smooth operation. The motor is a dual capacitor one and has sealed bearings as well as thermal overload protection. This means that even when you subject it to a very tough application, the motor will not overheat. The head pivots to allow you to make bevel cuts of 22 ½ and 45 degrees. Since the head is adjustable you will be able to adjust it so that you can cut tiles and bricks that are up to 3 ½ inches thick. This model offers all the features that you would be looking for on a tile saw used by professionals. The biggest hit is that you can adjust the blade to cut the application that you need to. The built-in water pump has the capacity to handle up to 3 gallons per minute of water, which provides an extremely cooling effect. It is important to note that the saw is sold alone and you will have to buy the stand separately. The maintenance of the saw is far much better than other models that tend to be quite complex. The Chicago Pneumatics tile saw comes with an adjustable cutting head that allows you to adjust the blade to make cuts of up to 3 ½ inches. The tile saw has a cutting capacity of up to 24 inches and the best thing is that it can be used for both standard tiles as well as bricks. This tile saw comes with a dual capacitor motor, which is quite powerful and comes with thermal overloads protection and sealed bearings. The head will pivot and allows you to make 22 ½ degree and 45-degree bevel cuts, effortlessly. There is a built-in water pump that has an amazing capacity of 3 gallons per minute. The SKIL 3540-01 RT is a new and refurbished wet tile saw. This is a 7-inch model and has an amperage of 4.2 amps, which is enough power to give you excellent performance in all your tiling projects. The saw comes with a stainless steel top, which is a great advantage as it is resistant to corrosion, making it durable. You will make use of the adjustable rip fence that has a miter gauge. This is an assurance that all your straight and miter cuts will be smooth and accurate. This is a tile saw that will give you a neat finish and does not break the tiles during the cutting process. The saw comes with a 7-inch diamond blade that is ideal for all the cuts and will give you a seamless performance. There is a blade cooling reservoir as well and this will keep the blade cool during the cutting process, while also minimizing the dust from the grinding process. This is an affordable tool and you will be able to execute most of the tiling projects like an expert. The SKIL 3540-01 RT tile saw will bevel cuts tile from 0 to 45 degrees. This offers you great flexibility as you can be able to make different types of cuts. The SKIL 3540-01 RT is an improved model of the tile saw and whether you are a DIYer or a professional expert, you will love the ease of use of this saw. All the features are designed to make it versatile and you will also love the fact that it is portable. This is a sturdy benchtop wet tile saw and as such, it is convenient to use for the delicate cutting processes for your tiles. If you are looking for the best tile saw, then you should take this into consideration as it is a quality tool, for a great price. The SKIL 3540-01 RT comes with a stainless steel table top that is corrosion resistant. As such, even it comes into contact with water, it will still be in perfect condition. There is a 7-inch diamond blade, which will facilitate different cuts, on different materials, especially tiles and masonry applications. You will get bevel cuts from 0 to 45 degrees, which is amazing flexibility offered by the saw to ensure that you get versatility. The blade cooling water reservoir is convenient as it keeps the blade cools, throughout the process and also reduces the dust and debris. The SKIL 3540-01 RT comes with an adjustable rip fence that has a miter gauge and this will allow you to make accurate miter and straight cuts. One thing that stands out in the PORTER-CABLE PCE980 is the fact that carries a wide range of features that are quite innovative. It is a light model and has a compact design, which makes it be the tool of choice for both hobbyists and professionals alike. Whether you are looking for accuracy or powerful performance, this is the best tile saw that you can choose and it will not be a disappointment. It comes with a metal cast cutting cart and this is part of the features that will ensure you get accurate cuts on the tiles. There is a splash guard that has been included on the PORTER-CABLE PCE980 and this is a crucial feature that will prevent over spraying of the water. The water will be directed to the blade area, which ensures that it serves the purpose effectively. The roll cage on this model is a protective feature as it protects the cutting cart. In addition, the cage will also make it easier to carry the tile saw from one point to another. The drain plug is included on this saw and this will help you when you need to drain the water, without creating a mess. 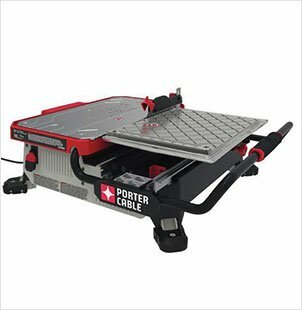 The beauty of the PORTER-CABLE PCE980 is the fact that it has a stainless steel deck that will not wear out easily. The cutting cut allows you to cut tiles that are up to 12 by 12 inches, for diagonal cut, as it has a cutting capacity of 17 inches. This tile saw has an accuracy of 1/16 inches and if you have repeat cuts, this will be the best model to use as it has an onboard miter square. 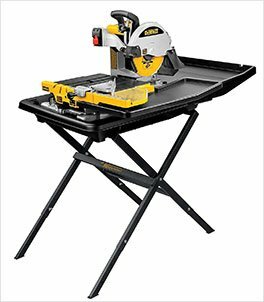 The 7-inch table top tile saw is also has a powerful motor of 1.0 HP and this gives it enough power to cut different types of tiles. The PORTER-CABLE PCE980 has a fixed deck, which is made of stainless steel and this is able to withstand wear and tear, from continued use. The onboard miter square is an ideal feature that allows you to make accurate repeat cuts in a consistent manner, without compromising on the accuracy. The roll cage will help in carrying the tile saw and will also protect the cutting cart when you have to store it. The splash guard on PORTER-CABLE PCE980 is a feature that has been included to ensure that the water is not over sprayed, when making cuts, but is limited to the blade and the workpiece. When you are done using the tile saw, the drain plug is a convenient feature that allows you to pour out the water into a bucket, without creating a mess. If you are shopping for wet tile saws, the SKIL 3540-02 is a 7 inch model that has most of the features that you may be looking for. This has become a common choice for most homeowners, who need high-quality tools for handling tiling tasks. 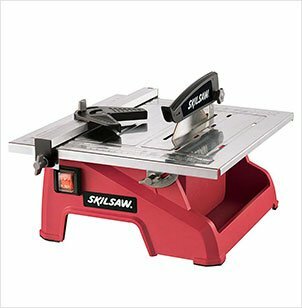 The saw comes with a stainless steel table top that will ensure that you have a smooth operation. This table top is resistant to corrosion and is durable. You can be sure that you will use this table with the tiling saw for a very long time and it will not defect. This is the key reason why I rank it as the best tile saw for all users. When you talk about a tile saw that has multiple uses, the SKIL 3540-02 is the best examples. This is made possible by the adjustable rip fence that comes with the miter gauge. This is a great feature to have as this allows you to make miter cuts that are straight and accurate. As if this is not enough, with this saw, you will be in a position to make bevel cuts from 0 to 45 degrees. This is great flexibility and this means that the tile saw will be used even for detailed cuts on your tiles as the bevel will provide the versatility to make different types of cuts. This is one of the best wet tile saws that you will have. It comes with a blade cooling water reservoir, which is an essential feature. This will prevent the blade from heating up and the water will flow constantly, which will reduce the dust from the cutting process. With an ideal weight of 24 pounds, you should not have any difficulty moving it or transporting the tile saw. The HydroLock system is also included to ensure that there are no instances of over spraying of the water, leaving you with very little mess to clean up. The SKIL 3540-02 comes with an adjustable rip fence that has a miter gauge and as such, you will be able to make accurate miter cuts as well as straight cuts. This model comes with a blade cooling water reservoir that will keep the blade cool while holding down the dust that comes from the cuts. The bevel cuts tile from 0 degrees to 45 degrees and this allows you to make various cuts on different materials including stones. The SKIL 3540-02 comes with a stainless steel table top that that supports tiles of up to 12 x 12 inches and is resistant to corrosion. This particular model weighs 24 pounds and is easy to assemble for use. When you are shopping for a tile saw, it is important to know what you really need. If you want a saw that will give you adequate torque, without taking too much space, you should go for the QEP 22400Q. This has a compact size and has a 3/5 HP. With this tool, you will be able to tile any place in your home, by cutting the tiles to the right size. While it is made in China, this is a convenient tool that gives you all that you will need for proper tiling. It is a powerful tool, yet it is easy to use and is also quite light as it weighs 8 pounds. When it comes to the maintenance of the QEP 22400Q tile saw, you will have very little to do. This is a 4-inch saw and comes with a 4-inch diamond blade that will cut different types of materials. With this saw, you can cut ceramic, terracotta and granite, among other materials. The fact that it is portable allows you to move to a different job site as you would please. This is a wet tile saw and comes with an amazing water cooling system. The water is recirculated and as such, you will not need to use a lot of water. The QEP 22400Q comes with a table that is sturdy and durable. This take is a convenient addition as it will tilt and also has 2 extensions. With this model, you will be able to make different types of cuts, including diagonal and rip cuts. The table allows you to miter cuts of 22 ½ degrees as well as at 45 degrees. 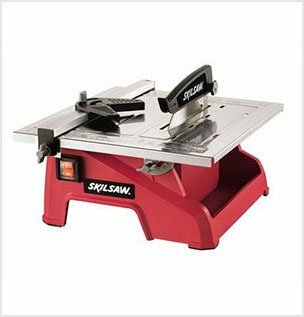 While the price seems to be higher than on the other models, this is certainly the best tile saw as it is quite versatile and will give you great performance. The QEP 22400Q is known as the torque master as it comes with a 3/5 HP motor that gives it enough torque for maximum cutting functionality. It comes with a 4-inch diamond blade and this makes it possible to cut granite, terracotta and ceramic tiles conveniently. This saw comes with a tilting table that has 2 side extension that will add an extra 5 inches to the table so as to support the large tiles. This is a wet tile saw and comes with a water reservoir and a mechanism to recycle the water, which is a great advantage. The QEP 22400Q is a compact model and quite light as it weighs only 8 pounds, making it a great job site tile saw. 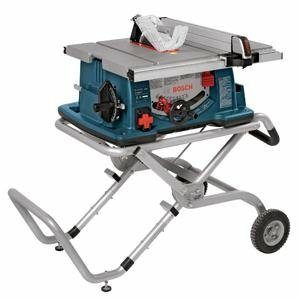 Having realized that there are so many models on the market, with each claiming to be the best tile saw, there has been another way to make a decision. There are a number of factors that you need to consider so as to buy the right one. Here are some pointers that have put together and they should help you in picking a good tile saw, for all tiling tasks. The horsepower of the tile saw is the one that will produce the torque that is required to cut tiles. In most cases, the handheld models are much lighter and will have a horsepower of about 0.5HP. The heavy-duty models may be above 1.2HP and these are used for cutting tougher and thick tiles. You should choose one that is in line with your needs. While looking at this, you should consider the blade rotation as well. The motor is an integral part of the tile saw and needs to be protected. The overload feature is crucial in that it will ensure that the motor does not overheat or cause the tile saw to burn. In most cases, you will realize that most models have an overload protection feature, but it is advisable to ensure that it is available, especially for the models that have direct drive motors. Just like any other task, tiling is a task that will need different dimensions and as such, you need to find a tile saw blade size that is suitable. When looking at the size of the blade, you will be considering the diameter and the depth of the blade. A good number of blades have a diameter of up to 27 inches and an angle diameter of 18 or 19 inches. The most common blade sizes are 4 ½, 7 and 10 inches. A 7-inch blade is ideal for most home projects. You may have a wet or a dry tile saw. If you are using a wet tile saw, you should be keen on the water source. The best option is to go for a model that has its own water reservoir as this will save you the trouble of having to fetch water. In addition, you should also pick one that has a recirculation system as it will keep reusing the water, thereby saving your water bills. Besides the size of the blade, you should look at the capacity that it has. This refers to the aptitude of the head of the saw to adjust and have a good system of holding the blade. You should look for a tile saw that can work with different sizes of blades and is easy to adjust so as to make different types of cuts. You will need to read and understand the user manual so that you can everything about the saw and the safe use. Before making any cuts, you need to ensure that the blade is sharp enough. This is the only way that you can be sure that the cuts will be neat, without cracks. 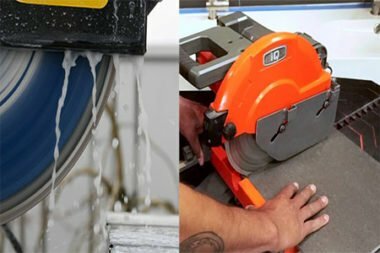 If you work with a wet tile saw, ensure that the water source is functional as this is the only way that the blade will remain cool, throughout the process. You will need to wear safety protection when working with the tile saw. Have safety goggles and also some earplugs, as a safety measure. In addition, you will need to have hand gloves when handling the tiles as well as the tile saw. Use the provided guides and ensure that the workpiece is properly marked as this is the best way to achieve accurate cuts. When you are making cuts on tiles, you should not force it to go through the blade, but instead, use a slow feed rate, to prevent breakages. 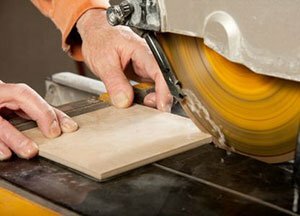 Check all the features of the tile saw to ensure that they are working properly before you can start the task of cutting. Always have the right blade for the specific task that you will be handling so as to get the desired results. Before placing the tiles against the blade, you need to ensure that the saw is turned on and running to the set speed, and then you can feed it through. Q: Will I get the tile saw already assembled? A: In most cases, the tile saws are usually preassembled. However, even the ones that are not assembled require very little set up, so as to start using them. Q: Can I use the tile saw to make cuts on the glass for my kitchen backsplash? 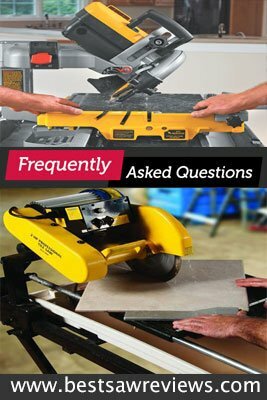 A: The tile saw can be used for cutting glass, but you will need to buy a blade that is designated for glass cutting. On average, this comes with a tile cutting blade. Q: Will I get a stand with the stand and will it be a folder stand? A: This is just a matter of the specific brand that you choose to purchase. There are those that come with a folding stand, while other models require you to buy the stand separately. Q: I need a saw for cutting some rocks that I have picked in different places, is this ideal? A: The secret in making use of the tile saw to cut different rocks is ensuring that you have the right blade. If you can buy the high end diamond blades, you should be able to cut a number of rocks. Q: Will the tile saw work with the marble tiles? A: Most tile saws are made to cut ceramic and porcelain tiles. However, for the marble tiles, you will need to have a power saw and the ideal blade so as to complete the task without any hitches. Have you been posting your tiling projects waiting for an expert? You can just go ahead and buy a professional tile saw and this will help you make amazing cuts, without a problem. There are so many brands on the market and as such, you can be confused. However, I am pretty sure that having come this far, you should be in a position to make a sound decision and pick the ideal model for your task. I have done detailed research to help me come with the models that I have reviewed on this buyer guide. When you follow this guide, you will be much informed and get the ideal tile saw. From the models that I have reviewed, I recommend the QEP 22400Q 3/5 HP Torque Master Tile Saw, 4-Inch as the best tile saw for all users. This will help you make professional cuts at all times and you will love the result. This guide is quite insightful and it would be paramount to share it with your friends and loved ones.